I would like to thank all those who have gathered here at the November 4th International Workers’ Solidarity Rally. My name is Sachihiko Fuse, and I am the hospital director at the Fukushima Collaborative Clinic. I provide clinical care in Fukushima prefecture, the location of the calamitous Fukushima Daiichi nuclear disaster, which started on March 11th, 2011. The Fukushima nuclear power plant experienced full meltdowns at three reactors. It is the worst nuclear catastrophe in history exceeding Chernobyl and Three Mile accidents. Abolish nuclear power plants immediately!—this is the duty for Japanese working class, and at the same time the common struggle of all workers in the whole world. I would like to introduce our clinic and explain the factors leading up to its establishment. After the nuclear disaster, the central government, the Fukushima prefectural government and authoritarian medical industry have been leading a denialist campaign: “there is no need to be concerned about radiation”. Under such pressure, residents of the area were concerned about the negative health effects deriving from nuclear contamination, and were refused care at medical facilities all around the prefecture with the reasoning that “there is no need to be concerned about radiation”. Almost no medical facility was available for medical consultation about health problem from radioactive contamination. That was when residents of Fukushima who were concerned about nuclear contamination-related health issues, as well as volunteer doctors from around the country began to solicit donations nationally and from around the world to establish a medical institution that operated with the understanding that “internal and low levels of radiation exposure were dangerous”. We received assistance not only in Japan, but also from Korea, Germany, America and the wider world and were able to open our clinic on December 1st, 2012. In that sense, this clinic is a crystallization of international solidarity by workers globally. I would like to first thank the workers of the world for their support. Our clinic provides care under the principles of “refuge, recuperation and care”. Fukushima is a radioactively contaminated area and its residents should evacuate. That’s why the first principle is “refuge”. However, there are a lot of people who can’t evacuate from Fukushima. For those people, recuperating in an area without the effects of radiation can reduce the health risks from radiation. That’s why the second principle is “recuperation”. Even now, many residents of the prefecture live in radioactively contaminated zones. Our clinic provides care to protect the health of those who have no choice but to live here. That’s why the third principle is “care”. Next, I will discuss problems that are affecting Fukushima. The biggest problem is the outbreak of childhood thyroid cancer. Currently, even in official prefecture figures, 194 people are confirmed or suspected of having contracted thyroid cancer, and 154 have been verified to have it via surgery. The UNSCEAR (United Nations Scientific Committee on the Effects of Atomic Radiation), Fukushima prefecture and the Japanese government have stated that “it would be unlikely that these cases are due to the effects of radiation”. However, the incidence of childhood thyroid cancer is usually 1 to 2 people in 1 million. In Fukushima prefecture, we have an incidence of 1 in 3,000 people. One can only conclude that these are the same effects of radiation the world saw after the Chernobyl nuclear accident. On top of it, the Japanese government has openly started to reduce and dismantle the health survey of childhood thyroid cancer. This is the international cover-up of radiation damage. We can never allow such a crime. The second problem is the state’s policy of forced radioactive exposure and the abandonment of residents under the pretense of reconstruction. The state has been returning residents to areas around Fukushima Daiichi, where an accident could again occur at any moment, highly contaminated regions that have an annual radiation measurement of up to 20 mSv (milli-sievert). They have cut the housing reimbursement allowance as of March of this year for those who have fled outside the prefecture. TEPCO (Toden) will also eliminate psychological compensation allowances for residents in shelter as of March. They are trying to drive these residents into economic distress, force them to return to their land and expose them to radiation. These are the abandonment policies of the state under the name of “reconstruction” and “return”. Fukushima Collaborative Clinic is fighting together with residents who are struggling not to return. It’s not just childhood thyroid cancer; other negative health effects are occurring, and there are full of problems like: radioactive water being pumped out into the sea, nuclear plant workers and other disaster-relief workers being forced into radioactive exposure, and the state attempting to indefinitely preserve radioactively contaminated materials in earthwork “intermediary storage facilities”. Next, I will report on our 5 years of activity after our establishment as a clinic. 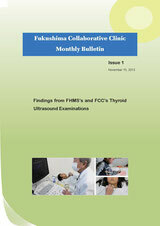 First is our provision of ultrasonic examination for thyroid cancer. Due to the outbreak of thyroid cancer owing to radiation exposure, we have provided these examinations for 3,000 children and adults. Second is our activity to protect the health of residents that have evacuated. We have provided health consultations for residents living in temporary housing who have evacuated to these facilities in the wake of the tsunami and subsequent radiation contamination. Third is our activity to protect the health of plant and decontamination workers. Plant workers are working even now to clean up after the nuclear plant disaster. There are also many workers performing radiation decontamination within the prefecture. Their work necessarily exposes them to radiation, but without their efforts, the livelihoods of the people of Fukushima could not be secured. Protecting their health is also an important part of our work at the clinic. Fourth is our lecturing activity around the country. These lectures are important activity to abolish all nuclear plants and prevent a second Fukushima disaster. We have also been working in solidarity with doctors fighting against nuclear power around the world since the outbreak of the nuclear catastrophe. Since 2015, we have had participating by anti-nuclear doctors from Korea, and messages of solidarity from the German branch of IPPNW (International Physicians for the Prevention of Nuclear War). We were invited and I participated in a Korean anti-nuclear international symposium held in the South Korean National Assembly building on January 18th of this year. Fifth is our support for evacuees both in and outside of Fukushima prefecture. 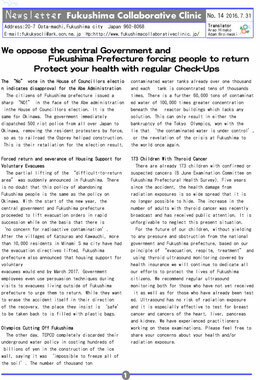 Not only in the prefecture, but also nationally we have been supporting refugees by collecting signatures against the policy of forced exposure to radiation and the return of residents. We have collected over 40,000 at this point. This petition work is a sign of rebellion from Fukushima. Why does the state insist that “there was no accident at Fukushima”? The Abe administration has paved the way for War Laws, the Secret Protection Act and Conspiracy Laws. The nation’s rage also continues to explode at the many payoff scandals. Faced with such political crisis, Shinzo Abe called a snap Lower House election to destroy the war renouncing current constitution and change Japan into a military state capable of waging war. War in the modern era is nuclear war. To have nuclear weapons you need nuclear plants—nuclear technology. That’s why the state is on the offense with “there was no accident at Fukushima”. The Fukushima Collaborative Clinic is raising its voice and reporting on health problems arising from radiation exposure, and demanding answers on how many decades, how many hundreds of years it will take to clean up from this accident, as well as placing the responsibility where it lies: the state, and TEPCO. This clinic alone cannot unseat the Abe administration. We need worker unions like the Korean Confederation of Trade Unions here in Japan. The November 5th worker rally is the starting point for an authentic revival of fighting labor unions amid the collapse of the Rengo federation. Let’s learn from the Korean people’s uprising, which defeated Park Geun-hye and create a labor union that fights with the Fukushima rebellion (Shut down all nuclear plants now!). Let’s stop the Tokyo Olympics and defeat Abe who will alter the constitution and bring war to Korea. Let’s abolish war and nuclear power from the earth with the power of workers internationally. Let’s build a world for us workers with the power of the international solidarity of militant unions.